Letters, manuscripts, and photographs documenting the life and work of Mabel Dodge Luhan. A writer, social activist, and arts aficionado, Mabel Dodge Luhan is celebrated less for her artistic accomplishments than for her key role in building artistic communities, supporting artists, and generating interest in modern art forms. A Buffalo, New York, native, she lived at the turn of the twentieth century in Florence, Italy, where she was a prominent figure among American expatriates and visitors that included Gertrude Stein, Carl Van Vechten, and Hutchins and Neith Boyce Hapgood. Returning to the United States in the 1910s, Mabel Dodge settled in Greenwich Village, where she helped organize the groundbreaking Armory show of Postimpressionist art and hosted perhaps the most important New York City salon of the period. She was acquainted with a cross-section of the city’s artistic and political communities, including people such as Margaret Sanger and Emma Goldman, and Marsden Hartley. By the end of the decade, she had moved to the Southwest, where she was at the center of a community of artists in Taos, New Mexico, which included Georgia O’Keeffe and Willa Cather. Luhan provided a point of intersection of individuals and ideas through her contacts and the countless connections she made possible between other artists and thinkers; the sheer weight of her associations made her a profound influence well beyond her closest group of friends and acquaintances. 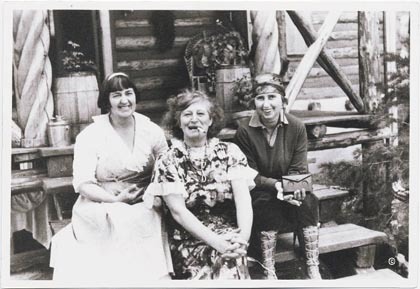 The Mabel Dodge Luhan Papers consist of letters, manuscripts, photographs and personal papers documenting the life and work of Mabel Dodge Luhan. The collection spans the years 1859-1961, with the bulk of the material dating from 1913-51. Currently, only a portion of the Mabel Dodge Luhan Papers are available online.